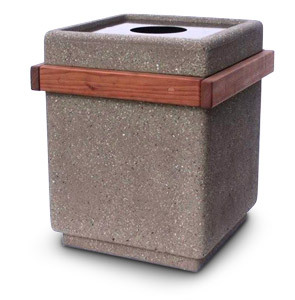 This Square Concrete Trash Receptacle features 2" x 4" Cedar Slats that are sealed and bolted to the receptacle to give the rugged concrete a softer look. Cedar dowel caps cover the 3/8" bolt heads for a sophisticated finish. The square fiberglass lid is secured with a vinyl coated cable, is available in brown, and has an 8" round opening that is hard to miss and makes it easy to keep your facility clean. The sheer weight of this concrete trash receptacle acts as a natural theft deterrent and will keep your trash receptacle safe in its place. 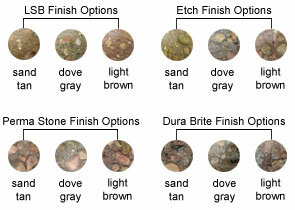 Available in Light Sand Blast, Etch, Perma Stone, and Dura Brite finish options, and is treated with a water-repellent sealer for ultimate weather resistant durability. 20 gallon rigid plastic liner is 13-1/2" Dia. x 27"H and is sold separately. 20 Gallon Liner Sold Separately. 2" x 4" Cedar Boards Bolted to Receptacle.